Lion Paws was ‘born’ on May 27, 2009 and made his first public appearance on May 28, 2009 at the District 12-N Officer Training in Powell, TN. Like all Lions, Paws is a volunteer who will take the time to come to your club’s event, service project or fundraiser! 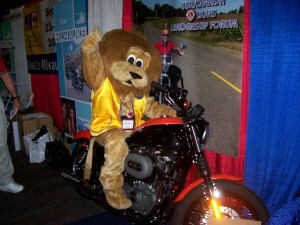 Lion Paws also has the support of several dedicated Lions Members to help him safely get to and from events. Lions District 12-N Charities, Inc. – the 501(c)3 organization that supports 9 different White Cane agencies. Contributions can be sent to the current District 12-N Treasurer. Contact information can be found at the Lions District 12-N web site.